Ben Stokes has always prioritized his fitness and his incredible out-fielding is just the byproduct of the amount of effort he puts in the gym every day. Yesterday, he stopped the game making teammate James Anderson wait to flaunt his fitness and did a proper handwalk, stunning Rob Key on air. After conceding the series by losing the first two matches, England made a stunning comeback in the third one and put up an all-round performance to pull one back. With the pressure of winning the series off the shoulders, Stokes was his usual self and decided to have some fun stopping the game for a while. With Anderson standing on his mark to bowl the next over, Stokes, after seeing Jonny Bairstow was still not his keeping mark, instantly turned himself upside down and put himself on a handstand. 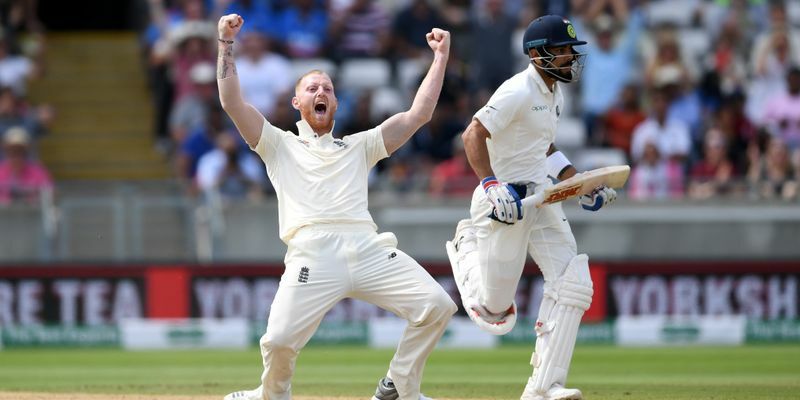 While many would struggle to be in the position even for few seconds, Stokes stunned everyone as he started walking in that position without any difficulty. Commentator Rob Key was astonished by that stunt as he started saying in air, “Wow. That's my moment of the series”. After finishing his stunt, Stokes brought himself back to the original position and started fielding at the slip to allow Anderson start bowling the over. Forget Holder's double ton and Wood's fiery spell - @RobKey612 has been bowled over by @BenStokes38's handstand!